» Consistent Applications Yield More Consistent Results! Consistent Applications Yield More Consistent Results! 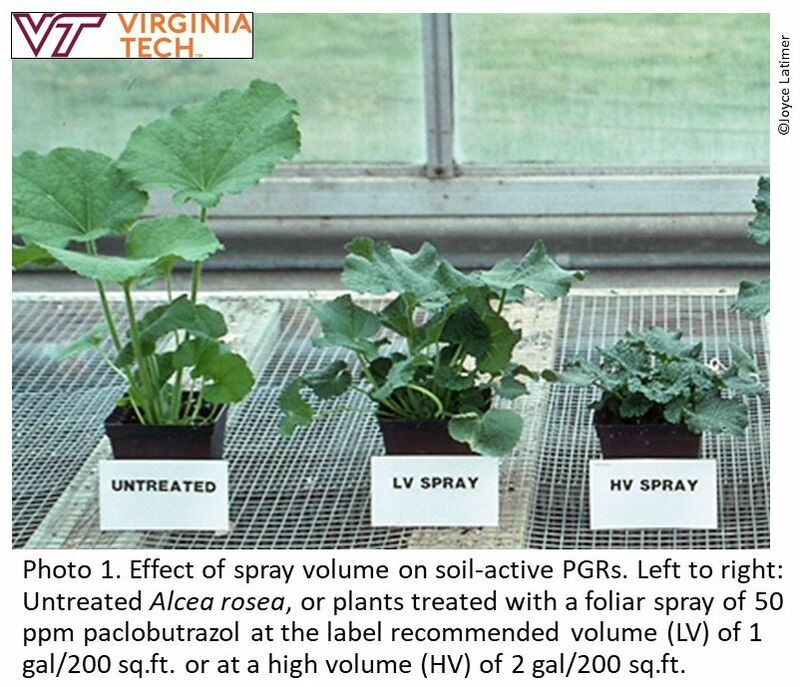 Spray applications of plant growth regulators (PGRs) involve a number of variables that affect the efficacy of the growth regulator. One of these that is particularly important – and one of the easiest to control – is application volume. Most of our plant growth retardants, like Abide (ancymidol), Piccolo or Piccolo 10 XC (paclobutrazol) and Concise (uniconazole), are soil active, i.e., they are rapidly and effectively taken up from the substrate solution by plant roots. This uptake results in a significant part of the effectiveness of the growth retardant. The label recommended volume of application for these PGRs is generally one gal per 200 sq.ft. of bench/floor space. Often this volume does not satisfy the applicator’s expectation of thoroughly wetting the plants. In cases where the application exceeds the recommended volume, the actual rate of the PGR is increased above the calculated rate. So, for example in the picture below, hollyhock liners were treated with a solution of 50 ppm paclobutrazol (Photo 1). The application volume was varied, with the LV plants receiving the label recommended volume and the HV receiving twice that volume. So, effectively the HV application was 100 ppm with the additional PGR carried in that 2x volume. This excess volume, which landed on the substrate, is washed into the root zone and available for growth regulation. Hence the much smaller plant. Furthermore, the recommended volume of the PGR solution must be evenly spread over that area to attain a consistent growth response from the treated plants. In Photo 2, you can see the variability in plant response due to the lack of a consistent application volume over the plot of hydrangeas. Both plants were treated with 10 ppm uniconazole during the same spray event, but one of them obviously received more growth retardant (a higher volume of spray) than did the other plant. The higher the degree of automation of spray (and drench) applications that you have in your greenhouse the greater the consistency of the application. However, if you lack the automation, the key to consistent applications of PGRs is practice! It is not critical that the application volume be one gallon per 200 sq.ft. You should establish the volume that you can consistently apply. This may be determined by your equipment output or your most consistent walking pace. The key is determine your application rates (the ppm in the solution) based on the volume you can consistently apply over your greenhouse or nursery space – not just week after week, but also year after year! You have to work out the details for your own crops grown under your own operational conditions. Identify one or two good growers to train as your PGR applicators. Then have those PGR applicators test products and rates and practice application consistency. Test and practice! Test and practice! Test and practice!